There's no doubt that the supply chain ecosystem is changing, and technology is the engine behind this transformation. Not only are everyday improvements in processing power and data storage empowering companies of all kinds, there are a few major new development areas promising huge leaps instead of tentative steps. The main question regarding these large-scale evolutionary steps isn't whether they have the potential to change logistics - they clearly do. Instead, departmental leaders have to ask when the tech changes will reach critical mass and be mature enough to adopt. Diving into a new IT process too early is a major problem, with large investments yielding disappointing results and competitors gaining ground by standing pat. Being late to the proverbial party is also a serious issue, with non-adopting organizations finding themselves suddenly out of step with an industry that has moved on. Therefore, it's important to track new developments as they approach a usable status, getting ready to invest at just the right moment. The following are a few of the IT trends set to crest over the coming years. When common functions are handled automatically, companies are free to change the way they use their employees' time. 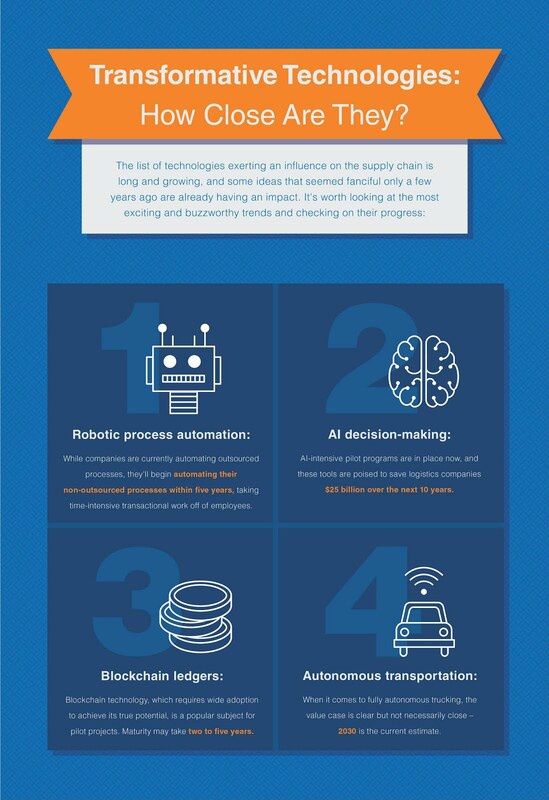 This transformation of labor is the reason robotic process automation is so consequential in the supply chain. According to CIO Magazine contributor Peter Bendor-Samuel, the next five years will be the critical period for adopting RPA for non-outsourced processes. This movement will enable large-scale changes on the way business processes are performed on an everyday basis. How much autonomy and logic do companies' big data analytics programs have? In the near future, empowered by artificial intelligence algorithms, these analysis methods will become stronger and faster. The promise of this technology involves making the decision-making process faster than it could be with a human making all the decisions. The exciting thing about this technology is it's already taking hold. The Economist cited Goldman Sachs data which indicated logistics costs will fall 5 percent over the next 10 years, for $25 billion in additional profits. There's no technology quite as hyped as blockchain systems. When data is stored in a blockchain ledger, it is accessed centrally and verified by both parties involved in a transaction, making the information consistent, transparent and theoretically tamper-proof. Companies have become acutely interested in transforming the potential of blockchain technology into real value, and many have already launched their pilot programs. Deloitte predicts these could bear fruit over the next two to five years. Trucks that can drive themselves with minimal human input have clear applications from a supply chain efficiency perspective - but are they ready to roll? These solutions need to have plenty of support systems in place to become an effective, reliable and safe option for companies. The fully autonomous version of robotic trucking is still a ways off, with Automotive Logistics contributor Phil Gibbs stating the industry consensus for when we'll see this breakthrough puts the date at 2030. Transforming a whole industry isn't simple, and it doesn't happen overnight. When leaders don't pay attention, however, breakthroughs can sneak up on them.